This mountain is the highest point in a somewhat isolated mountain area, completely disconnected from the Carpathian Mountains. Locate Hwy. E-79 going northwest, passing the cities of Deva and Brad. Continue north to Vascau and Stei, locate Hwy. 75 going east and drive uphill to the main pass at elevation 1140 meter. 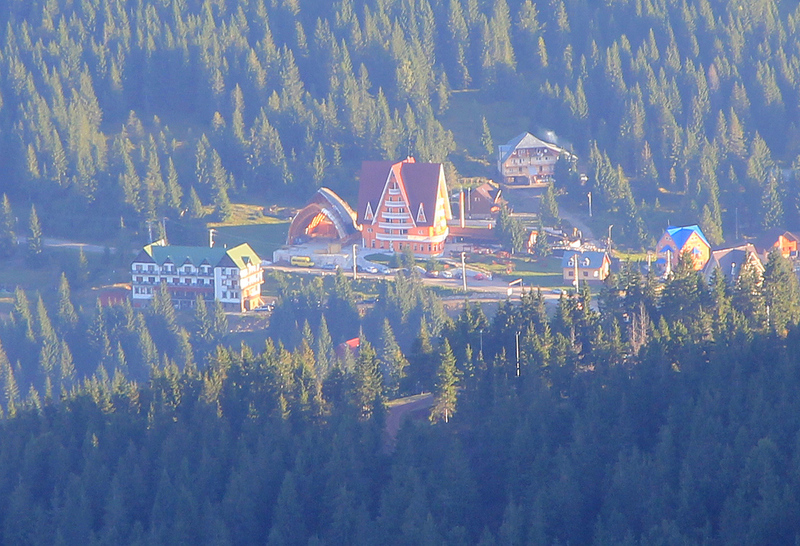 This area is being developed as a ski area. Locate a small wind mill on your right and drive the short access road to the ski area itself. Park here, this is a good trailhead, location N46:30.676, E022:40.275, elevation about 1180 meter. We stayed at the very friendly hotel Four Seasons. They could provide a local hiking map as well as sharing personal knowledge about the area. From the trailhead, continue horizontally and locate a forest road that climbs gently westward. Follow this road, you will notice that the route is marked with a red stripe (on white). Shortly, there is a fork where a newer forest road climbs more steeply left. Ignore this and continue along the (older) road, you should see more trail markers. After a short stretch, this road enters a clearing where it subsequently makes a left turn and heads downhill. This location is N46:30.084, E022:40.127, elevation about 1300 meter. Leave the road here and follow the rough (water damaged) trail that forks left. The trail markers will also show the way. 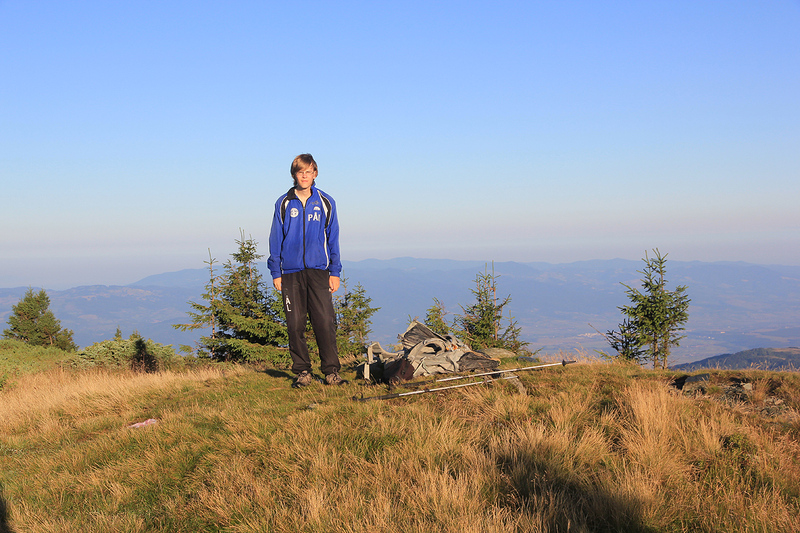 Climb steeply until gaining the main ridge, then follow the ridge to the crest of Piatra Graitoare, 1658 meter. You will now see Bihor with its characteristic antenna across a broad saddle. 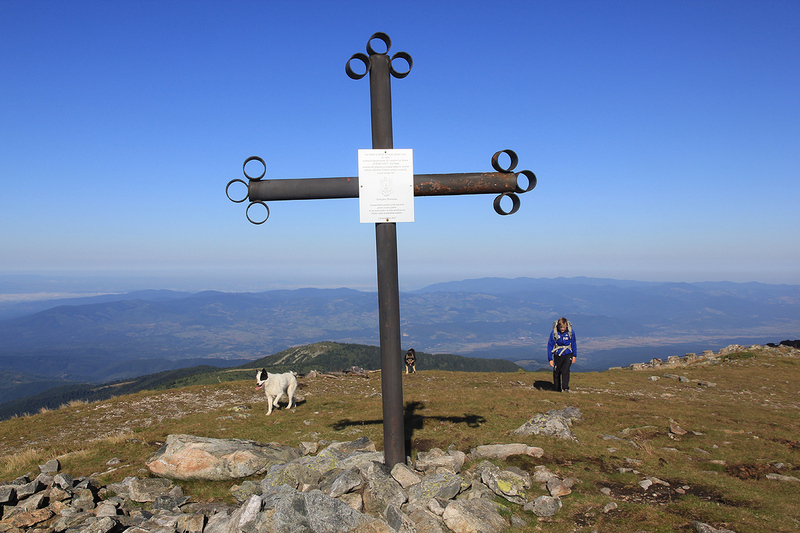 Consider a visit to the top of Piatra Graitoare first, its summit is to the right at the very far end of the main ridge. The marked trail descends towards the broad saddle, however, one may easily first visit the local summit, then cross back down to recover the trail, or simply backtrack a bit and pick up a more visible trail that heads downhill. The route follows and old vehicle track and is quite easy as it crosses rolling fields, then climbs the ridge while turning right. Finally, you cross a distinct, local bump, descend to the last saddle and climb a final slope in order to gain the summit. 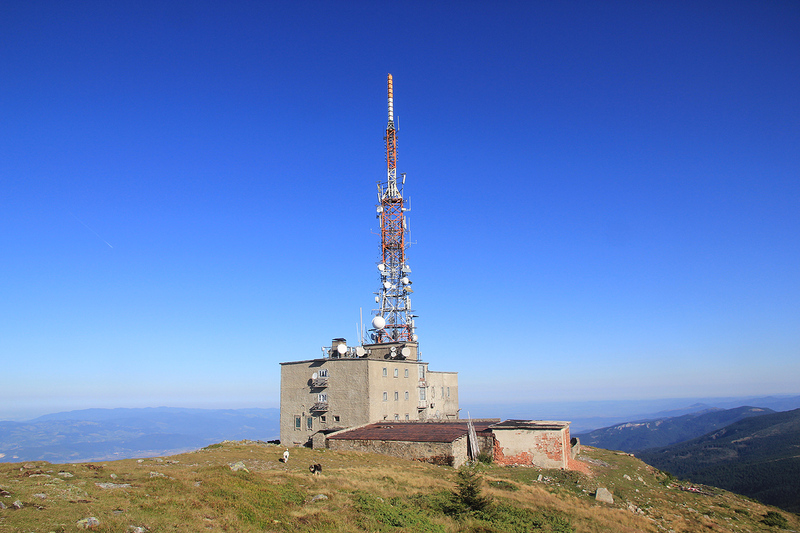 Walk around the antenna complex to locate the highest point marked with an iron cross on the south side. I did this climb with my son Pål Jørgen. 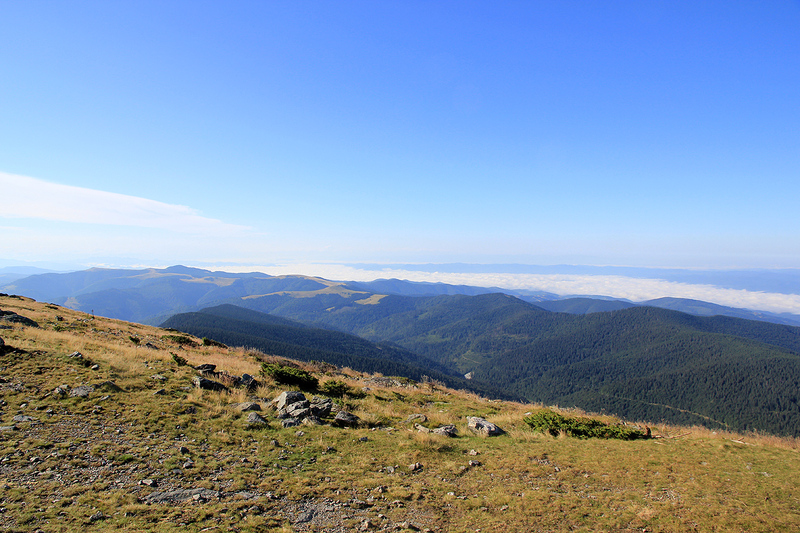 To see more about our trip in Romania, go to the overview page for this trip. We left the trailhead at 0645 and quickly arrived at the area where the trail forks off from the road and heads steeply uphill. This trail has clear signs of erosion from water that sometimes comes down here. The morning was nice and we gained the main ridge fairly quickly. 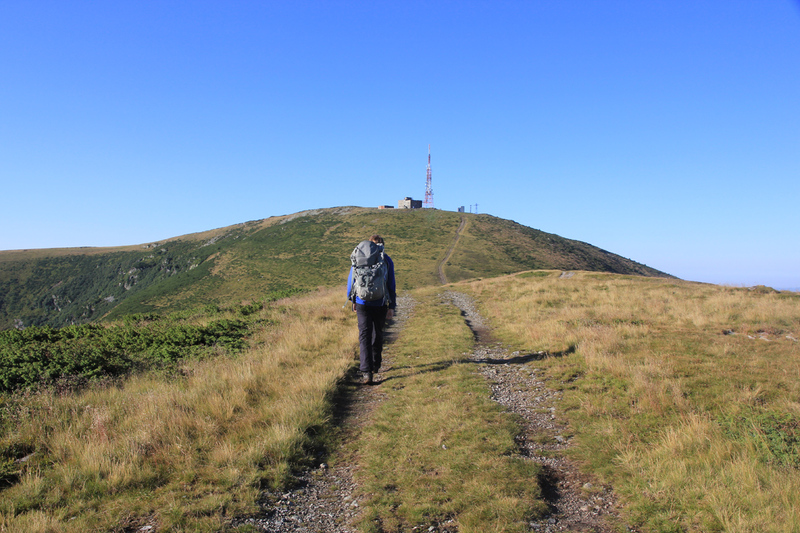 As the trail crosses the main summit ridge of Piatra Graitoare, we decided to follow the tracks right to the very summit. It was fairly easy to cross through the vegetation and thus make a short-cut back to the main route. We noted the key (prominence) saddle along the way to our main objective. The walk was nice and easy and we arrived at the summit at 0905 in the morning. 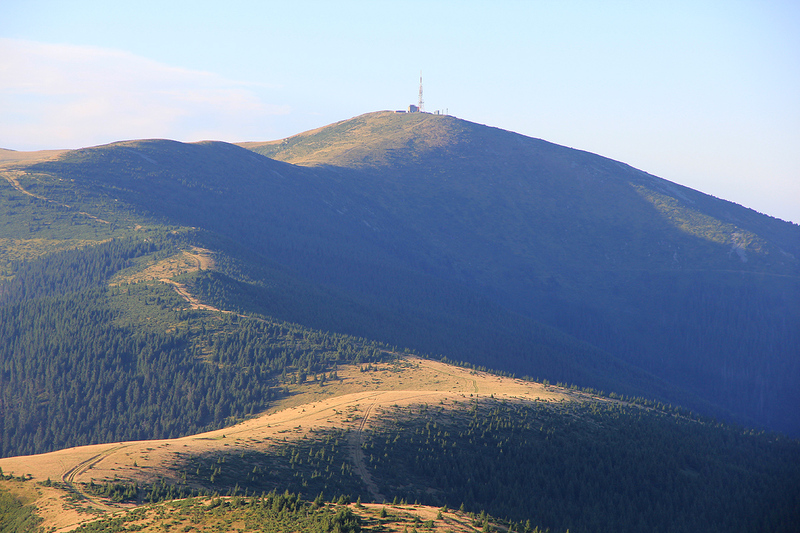 The summit is separated from the antenna complex. We enjoyed the views and entertained the three local dogs before leaving at 0920. The hike back was equally nice. 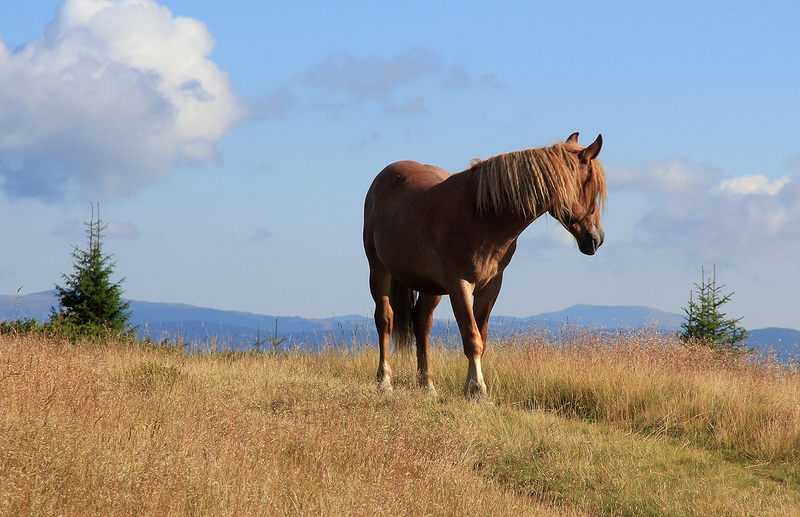 We ran across a nice horse having his harem a bit further downhill, measured the prominence saddle of Piatra Graitoare carefully, before gaining its ridge. As we descended the final slope, a few other hikers were coming uphill. We were back by the car by 1115, leaving us adequate time to drive towards our next and final goal. 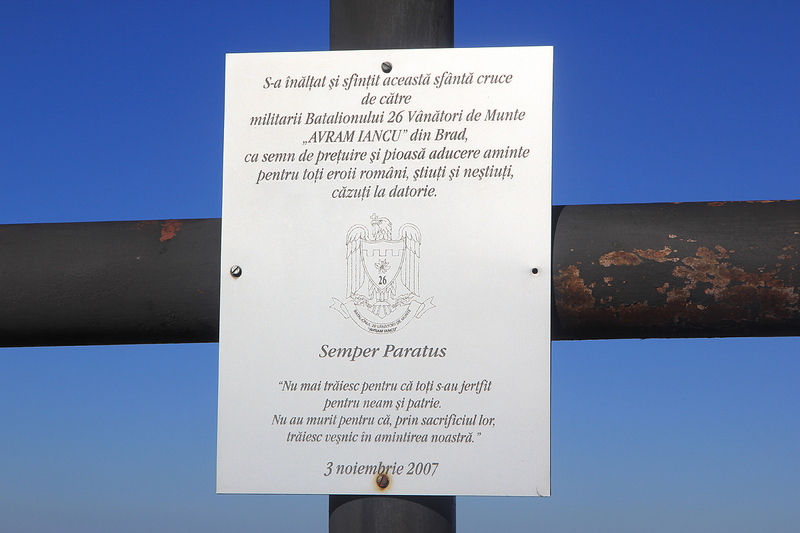 The inscription, on the summit cross.